West Mountain Radio is pleased to announce that we have been selected as Principal Awards Sponsor for the 2006 & 2007 ARRL RTTY Roundups. West Mountain Radio has agreed to serve as the sponsor for nearly 50 plaques currently unsponsored that recognize various levels of operating achievement in what is considered by many to be the premier worldwide digital contest. West Mountain Radio will pick up sponsorship of plaques for any Overall W/VE or DX Category winners or ARRL Division winners that are not already purchased by longtime supporting clubs and individuals. WMR CEO Dan Gravereaux, N1ZZ, said he hopes the cooperative arrangement will help to spur more interest in digital mode contesting and operating. "We at West Mountain Radio have worked very hard to make RTTY and other digital modes more accessible to the Amateur Radio community," he said. During the RTTY Roundup look for K1WMR, the WMR Contest Club, as many of our West Mountain Radio personnel will be operating this station. Fast easy hookup - Minimum time to the first QSO! USB interface compatible with all ham radio programs. Rig control, USB to serial TTL interface - Icom Kenwood, Yaesu, Ten Tec. 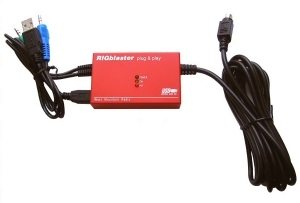 RIGblaster P&P connects to your sound card insuring proper operation with all soundcard software. Custom Windows driver pre-installation for painless PnP on Windows 98SE and higher. Unlike our other RIGblasters the plug & play model works with most modern radio data or aux jacks, not through the mic jack. Very small and compact and powered from the USB port of your computer. Must be ordered with a plug & play adapter for your specific radio. Check our Radio Matrix to see which adapter is required for your radio. The RIGrunner 8012 is the latest addition to the RIGrunner line of DC Distribution Panels from West Mountain Radio. The 8012 provides distribution of up to 80 amps at 12 VDC across two 40 amp busses. 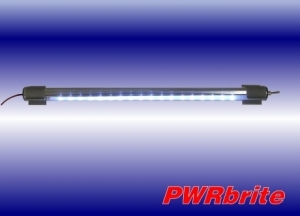 The PWRbrite is a low current, high output LED light designed to be mounted to any flat surface. The self-adhesive, snap-in mounting clips allow for easy installation. Unlike other LED lights on the market, the PWRbrite provides consistently bright light over a wide range of voltage. LEDs produce little, if any, heat and resist shock and impact. Use to illuminate your ham operating position, workbench or outdoor mobile setup. The CBA is the easy and inexpensive way to accurately measure the health of any size or type of battery. The CBA Amplifier is an add-on accessory for CBA designed to extend the range of the CBA up to 500 Watts or 160 Amperes (whichever is higher). 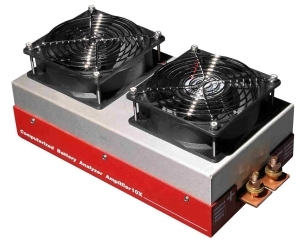 Competition RC modelers may wish to purchase an amplifier for high rate testing. CBA Amplifier is intended primarily for commercial or industrial customers who need to test batteries close to their maximum limits. 2005 proved the importance of Amateur Radio emergency preparedness. West Mountain Radio has products that can prepare your ham station for 2006 and any emergencies and the power outages it may bring. A PG40 or PG40S will, without interruption, safely power your station from either a Power Supply or a Battery and they also have a built in charging circuits. Either the PWRgate PG40 or the Super PWRgate PG40S Backup Power Systems, when used in conjunction with a RIGrunner, will provide uninterrupted power to all your 12VDC Ham Station Equipment. The PG40S has a modern State-of-the-Art multi stage charging circuit that will intelligently charge and maintain a battery. The PG40 has a simple float charger which will maintain a charged battery. We also carry quality sealed AGM and Gelled Batteries suitable for indoor use. Both are Group 24 size and are rated at about 75 AHr which will provide many hours of emergency operation. So that you will know the status of your batteries at all times, we have the WhattMeter which will simultaneously read out Volts, Amps, AmpHours, Watts and WhattHours. All of these products have Anderson Powerpole® connecters, especially convenient for all your 12VDC equipment. For installing Powerpole® connectors, we recommend our PWRcrimp Crimp Tool, a quality crimping tool designed specially for 15, 30 and 45A Powerpole® connectors. We also carry pre-packaged Powerpole® Connectors in 15, 30 and 45A sizes.